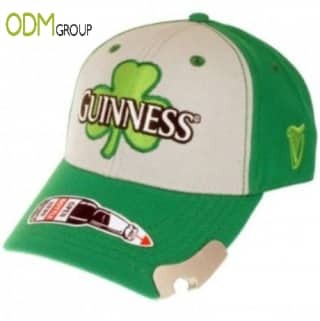 Looking to innovate further your promotional baseball cap? Why not add functions to your promo gift to be able to offer your customers with handy items. Check out what one of the biggest beer drink brand has been doing as part of their summer promotion. Imagine how practical and useful this promotional item would be for young people who spend weekends in beer festivals! Apart from this, since this product is a really cool item, it will have a massive exposure with the public as it will grab their attention. Apart from offering the possibility to open bottles anywhere you are also protecting your customers from the sun. Handy! 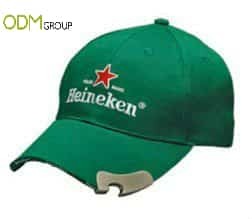 The baseball cap itself has a great printing area which is excellent to brand your drink brand! How will this promotional baseball cap enable us to get more consumers? Nowadays, the promotional sector is becoming too trendy and people tend to follow what they see popular. Imagine your brand being associated with trend setting news! Fantastic. With baseball caps we can play around with the quality of the cotton material to get the cheapest or expensive result. MOQ for these kind of items is normally from 1.000 – 2.000 pieces is quite inexpensive to include within your marketing promotions to attract and retain new consumers. In here you will be able to learn more about the manufacturing processes involved in the procurement of baseball caps as well as printing options that will match your requirements. If you are looking for anything more unique, don´t hesitate to contact our design team to advice on new concepts that will make your brand more exclusive!